Johann Jacob Baeyer, my great-great-grandfather (1794-1885), was a famous German geodesist. See the description of his work on the International Association of Geodesy Web page. Visit Johann Jacob's Wikipedia page -- in German only. Adolf von Baeyer, Johann's son, my great-grandfather, won the Nobel Prize for chemistry in 1905. The Nobel Prize website has a picture, a full biography, a full description of the work he did to win the prize, and the Swedish postage stamp featuring him. Hildegard von Baeyer -- My grandmother's Guest Book, Heidelberg 1918-1958. In German (requires login). Hans Ritter von Baeyer -- My grandfather, a professor of orthopedics at the University of Heidelberg. Hans Jakob von Baeyer -- My father's contribution to telecommunications in Canada. Renata von Baeyer -- Some of my mother's German poetry with English translations. Walter von Baeyer -- My uncle, a psychiatrist and neurologist. In German. 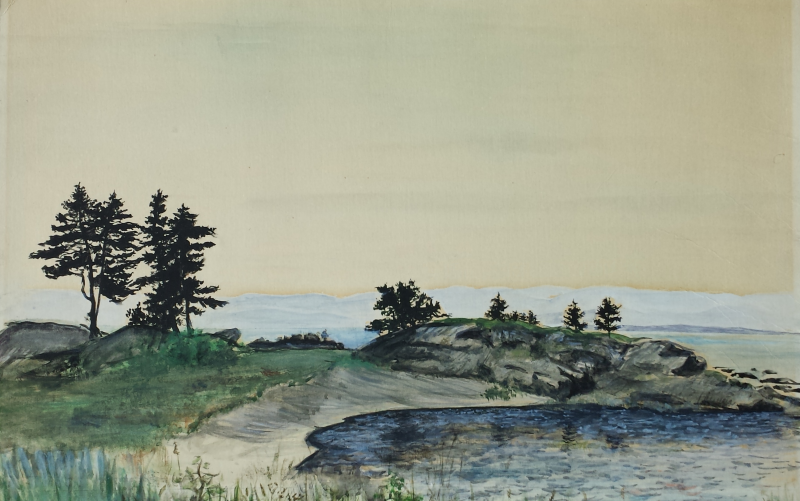 Eric von Baeyer -- My uncle, a radiologist, painter and cellist in Cleveland. Edwinna von Baeyer -- My very nearest, and dearest -- landscape historian, writer, editor. Eliza von Baeyer -- Our eldest -- postgrad in human & organizational development, and, as Indie*Go Designs, creator of fun, funky, original jewellery. Carl von Baeyer -- My brother, a psychologist and ukulele player. Hans Christian von Baeyer -- My brother, a physicist retired from the College of William and Mary. Veronika Finckh, née von Baeyer -- My sister, who once upon a time painted pictures (see two below). Chris von Baeyer -- My nephew, an actor, educator and consultant in Toronto. Here is one of my sister Veronika's paintings. It was done in St. Patrick, Québec in August 1952 when she was 16. Prime Minister St. Laurent happened by while she was painting, and praised it. She then did a portrait of his grandson and presented it to him. See his letter of appreciation, with a bit more of the story. 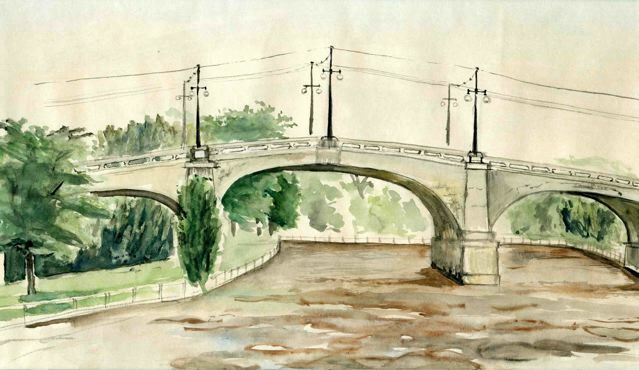 The second was done circa 1955 in Ottawa, a view of Bank Street bridge which was included in the 2013 publication Exploring the Built Heritage of Old Ottawa South, and is on the Ottawa South History Project website. See the article I wrote with Kathy Krywicki about Slattery's Field in Old Ottawa South: Ottawa's First Accidental Airfield for the OSCAR of January 2010. See the piece I wrote with Kathy Krywicki on Our Community 100 Years Ago: A Sketch of Old Ottawa South in 1911 for the OSCAR of January 2011.